My first attempt was not hugely successful. I tried it with my Early Entry Twos ... (very pre-entry, illiterate in their own language, refugees) They enjoyed the wordle and talking about my family and to be fair the task was quite challenging and helpful for them in terms of filling in the table. But it took too much time and they just didn't have the language to do the next stage. I think my text was too long... although I did think it would work with E1s! I passed the idea on to another teacher and she took it a step further by creating a text based around her house and 'there is/are' that her E1 learners had been working on. She didn't get to the actual text recreation either but she really enjoyed the lesson. This was mainly because her learners loved the task so much especially the personal nature of the text. Then inspired by this I wrote a text about my neighbourhood to do with my E1s and wahoo it worked! They enjoyed the discussion, they enjoyed working together, they found it challenging and didn't think they could do it but... every single group recreated a great approximation of the text. Even better it led straight into some fun speaking and then personal writing on their neighbourhoods which I can use to try out the next WriteWays Unit found here next week! I love this idea. It's infinitely adaptable and personal... especially if you write the text about yourself or something meaningful to the learners. Certainly with lower levels you could pretty much write the text on the spot if need be. Anna! so glad you didn't give up after the first trial. It seems its really working for you! It seems to me that the strategy you used is a variation on the "disappearing text:" strategy because of the recreation part. Especially if you write the text with the students! I'm very grateful for your help with that one - am still exploring the possibilities with so many levels! Feel free to post there directly whenever you want to share. Thanks Naomi - interesting comments - yeah it is similar - I guess disappearing text is done via reading and speaking. Whereas dictogloss is done via listening and writing so two sides of the same coin. In this case I wrote the texts before hand but you could easily do it off the cuff in class. I've really enjoyed reading about your explorations and looking forward to hearing more! Some great use (and more importantly, exploration) of the dictogloss idea. I especially like your use of personal/real-life texts. In one school I managed, as part of the curriculum at the start of term I had all teachers write a script about themselves than modify it for three different levels. This then became a series of dictogloss scripts to use for their first classes of the term! Learners got to know their teacher pretty well in that first lesson, but were also immediately catapulted into working with classmates on something intensive. It went down very well. One thing I would recommend is using texts the learners have already had an opportunity to read (including through things like 'live reading'), as it does have significant impact on the learners' capacity to recognise and work with features of the text through dictogloss. Without exposure to the text beforehand, it makes the activity quite difficult and intensive for learners, which can be great for later or upper level application, but using it early or for lower levels can turn them off the task based on the difficulty level. Cheers - LOVE this blog! 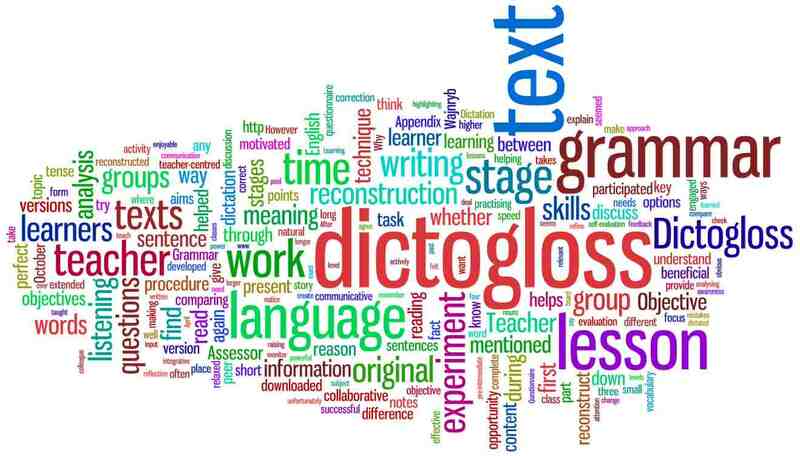 I just came across this post through the Teaching English FaceBook page - 'dictogloss' in the title always gets my attention and I was pleasantly surprised to find not only a great post but a glowing reference for my post as well. Thanks! Thanks also for telling us about the attempt that didn't work so well and how you shared the idea with a colleague and then tried again. I think reflecting on and describing the things which didn't go as planned is just as important as sharing the ideas that worked well. As Jason suggests, this wprks even better and is easier for students to handle when a short text they have read recently is used. I did it with an 'unknown' text as they knew most of the information about me anyway and I only had a single 40-minute period to tackle it in. Using students own written work is great for some added student-generated content as well. Thank you Jason – I feel very overwhelmed by the extent and depth of all your recent comments, flattered that you've taken the time to tell me about your experiences and enormously encouraged both by the positive feedback and the great suggestions of how I can improve. They are really valued. The reason I've been reading online blogs and writing this one has been to learn and improve my own teaching. People's responses since sharing these experiences have been so helpful and I can't tell you how much I appreciate you and others taking the time... not only to share such amazing ideas and materials but then to feedback in such depth to my own attempts and experiments. It's blown me away to be honest and I don't say that lightly. Thank you – your encouragement and constructive feedback are hugely motivating. Hi David – thanks and you're most welcome – as you can see my approach was pretty much identical to the one you kindly shared and it was immensely helpful to have such a clear model to follow – it gave me the courage to give it a go! Thanks for the feedback on ways to improve... I can definitely see the value in using a familiar text. I like the idea of using the learners own written work as a listening... it's just bound to make it that much more personal and interesting for them. I also think you're right about sharing the things that didn't go to plan. So following yours and Jason's comments I will probably write my next post on that subject! My inclination is always to tell the success stories or the failure story closely followed by the success story but real life/teaching isn't always like that and it is good to be honest about that, however hard it might be.